Aaaaand another way to eat corn. Isn't this fun-looking? Unnecessary, but fun. Slice the cob into thirds, along with your veggies of choice. I chose red pepper, mushroom, and onion, and then tossed them with a pinch of olive oil and balsamic vinegar. I kept the corn plain, because I knew there would be plenty of buttering and salting going on later. 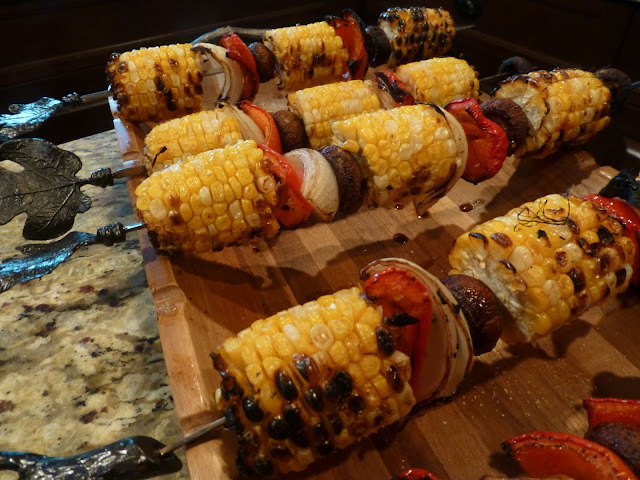 Thread the vegetables onto the skewers (a bit tricky for the corn, but if you stab it through, then twist it a bit to increase the hole size you should be good to go), then grill for about 20-30 minutes over medium heat.